President Barack Obama said the White House played no part in choosing the museums where NASA's retired space shuttles will be displayed, and that the city of Houston was not overlooked for political reasons, according to news reports. In an interview with a local Texas TV reporter, Obama maintained that the retirement of NASA's three space shuttles and a test orbiter to museums around the country was not politically charged. "The White House has nothing to do with it," Obama told Brad Watson, a reporter with Belo TV, which is part of a conglomerate that owns several TV stations in Texas. The video was posted online on the Yahoo news blog, The Ticket. Obama further emphasized that politics did not influence the decision-making process after Watson implied that the orbiters had been awarded to states that are critical for his re-election. "I just said that was wrong," Obama insisted. "I just said that wasn't true." Following their retirement, Discovery, Atlantis and Endeavour will be moved to their future homes at, respectively, the Smithsonian, the Kennedy Space Center in Cape Canaveral, Fla., and the California Science Center in Los Angeles. Enterprise, which was used in early glide tests but never flew in space, was awarded to the Intrepid Sea, Air & Space Museum, which is housed in the USS Intrepid World War II aircraft carrier at Pier 86 on the west side of Manhattan. Controversy quickly followed, particularly among those who were disappointed that Houston's Johnson Space Center was not among the finalists. The Johnson Space Center is the nerve center of space shuttle mission control and is where NASA's astronaut corps lives and works. 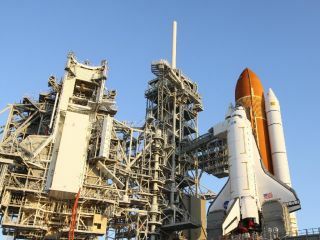 On April 14, Congressman Jason Chaffetz (R-UT) introduced a bill called the "Space Shuttle Retirement Act," which would establish sites in Texas, Florida, California and Virginia (the Smithsonian) as museum destinations for the retired space shuttles. Former space shuttle program manager Wayne Hale responded to the outcry in a blog post, saying Houston did not get a retired orbiter because the city does not deserve one. The post, which originally appeared on Hale's personal blog, was also reprinted on Space News. "Not that we don’t have a long history with the shuttle; it was largely designed here; the program was managed from here from the beginning to the end, every single mission was planned here, the astronauts who flew the shuttle are based here, trained here, live here. Mission control is here," Hale wrote. "But Houston is blasé about the shuttles. Houston and Texas have come to regard NASA and JSC as entitlements." Obama and his family will attend NASA's planned launch of the space shuttle Endeavour on April 29, according to a White House official.